The Chkalov Aircraft-Making Enterprise in Novosibirsk in west Siberia has rolled out the 100th Su-34 (NATO reporting name: Fullback) fighter-bomber, Deputy Prime Minister Dmitry Rogozin announced on his Facebook page on August 19. The first contract for the delivery of Su-34 combat planes was signed with the Russian Defense Ministry in 2008. Four years later, the advanced fighter-bomber entered service with Russia’s Aerospace Force. 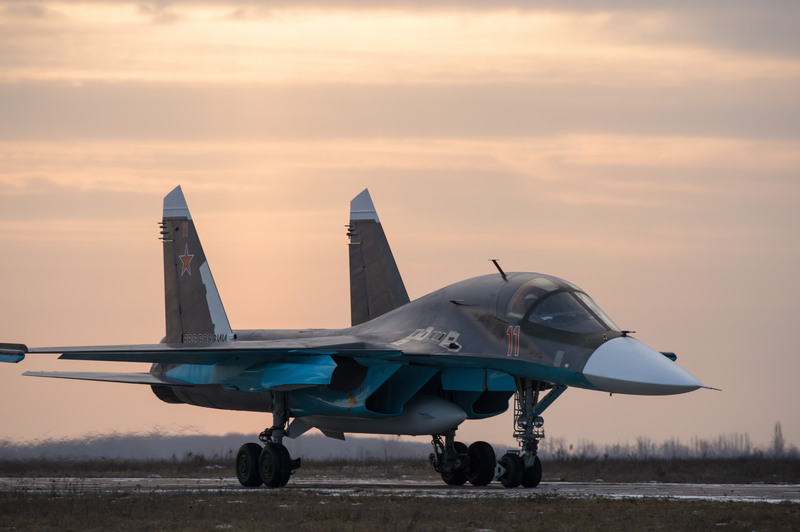 As Commander-in-Chief of Russia’s Aerospace Force Viktor Bondarev said earlier, the Su-34 will eventually replace Su-24 (Fencer) frontline bombers and Su-25 (Frogfoot) attack aircraft. The Russian Aerospace Force is expected to receive no less than 200 Su-34 fighter-bombers under the state armament program through 2020. The Russian air task force is successfully using these warplanes in an operation in Syria against militants of the Islamic State (terrorist organization outlawed in Russia). The aircraft features a standard aerodynamic layout with an additional foreplane, a trapezoidal midwing, twin vertical tails, two AL-31F engines in the fuselage’ rear and tricycle landing gear. The crew comprises a pilot and a navigator sitting side by side in an armored cockpit. The cockpit can be accessed through a lower hatch by climbing the footsteps. Commander of a Su-34 air wing, Captain Alexei Belonog who has logged almost a thousand flight hours and mastered four types of aircraft told TASS on the eve of Military Aviation Day that precisely the Su-34 fighter bomber was an indisputable favorite for him. The Su-34 is a favorite plane among many pilots as it features a spacious and comfortable cockpit and excellent flight characteristics. “Of course, it is not designed for aerobatics but it can also experience overloads of up to 7.5G [overloads experienced by pilots when they perform aerobatic maneuvers],” the pilot said. The Su-34 two-seat frontline bomber is capable of operating equally efficiently day and night and in any weather conditions. The Su-34 dubbed as Fullback under NATO classification is designed to deliver missile and bomb strikes against ground objectives and destroy an enemy’s aerial targets. 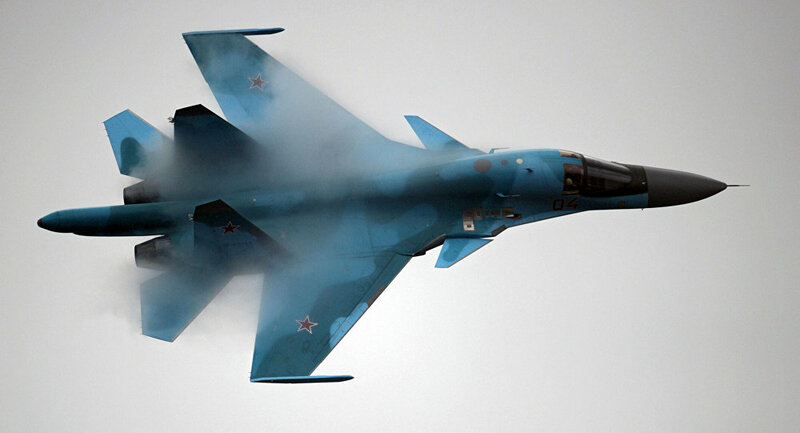 The Su-34, which is a modified version of the Su-27 (Flanker) fighter aircraft, has been developed by the Sukhoi design bureau under the guidance of its chief designer Rollan Martirosov. The fighter bomber has been serial produced at the Novosibirsk-based Aircraft-Making Enterprise since 2006. The Su-34 performed its debut flight in 1990 (the prototype aircraft T-10V-1 was piloted by USSR honored test pilot Anatoly Ivanov). The Su-34 was developed for promptly redeploying it for missions from any parts of the country to its border to reliably seal off a possible armed conflict before the arrival of the main forces. All conditions have been created in the Su-34 for this. As compared to other fighter jets, the crew is accommodated side by side in the cockpit rather than one after the other. “There is space between them where a matrass can be spread and one of the crewmembers can have a rest during a flight,” the military expert said. Besides, the space behind the pilots’ seats allows them to stand up to their full height. According to data from open sources, the Su-34 is 23.3 meters long and 6.4 meters high and has a wing span of 14.7 meters. The plane has a service ceiling of 14,650 meters and a flying range of 4,500 kilometers without refueling and 7,000 kilometers with refueling. The Su-34 fighter bomber has a mission radius of up to 1,100 km. The plane has a take-off weight of 45.1 tons and a combat load weight of 8 tons. The plane can develop a speed of up to 1,900 km/h. The Su-34 is armed with a 30mm gun and its 12 hardpoints can carry various types of air-to-air and air-to-surface aircraft-launched missiles, rockets and air bombs. The interest of foreign customers in Russian planes, especially Su-34 fighter bombers, has increased after the Russian air task force’s operation in Syria. In particular, this interest has been displayed by some countries in the Middle East. In 2015, Rosoboronexport initiated the preparation of an export configuration certificate for the Su-34. In 2016, an expected contract with Algeria may be signed on the delivery of frontline bombers. Negotiations on this issue are already under way and have progressed while a contract has not been signed yet. Russia’s Su-34 planes accomplished combat missions for the first time during the war in South Ossetia in 2008. The fighter bombers were used to provide cover for attack aircraft, conducting electronic warfare against Georgian air defense systems with the use of the Khibiny jamming station. The Su-34 fighter bombers conducted jamming from the warplanes’ combat formations, preventing Georgian air defense systems from successful jammer out-tuning, and also destroyed a key radar near Gori by an anti-radar missile. Since 2015, the Su-34 fighter-bomber has been frequently shown in video footage on television channels reporting about the Russian air task force’s operation in Syria. Military specialists, numerous experts and analysts watch with interest its successful performance. Su-34 planes flew sorties not only with OFAB-500 and adjustable KAB-500 air bombs but also with air-to-air short- and medium-range missiles. The Su-34’s weapons suite includes R-73 (NATO reporting name: AA-11 Archer) short-range and R-27 (AA-10 Alamo) medium-range air-to-air missiles. The Su-34 fighter-bomber can carry up to six R-73 missiles in launchers placed at the aircraft’s wingtips or under the wings and up to eight R-27 missiles that can be mounted on ejector racks or launchers both under the wing and on underfuselage hardpoints. The Su-34 planes were used for the first time in the spring of 2016 to eliminate ice jams. Their mission caused the largest flooding in the past 20 years on the Severnaya Dvina River in the Vologda and the Arkhanglesk Regions. The bombers performed two sorties each, dropping eight bombs with a total weight of 4 tons. On August 16, the Su-34 fighter-bombers took off for the first time from Iran’s Hamadan airfield to deliver a strike against militants in Syria. The sortie also involved Russian Tupolev Tu-22M3 long-range bombers. They dealt a blow against the objectives of the Islamic State and Jabhat al-Nusra groupings (terrorist organizations outlawed in Russia) in the Syrian provinces of Aleppo, Deir ez-Zor and Idlib. A Sukhoi Su-34 bomber has been named after Lieutenant-Colonel Oleg Peshkov, the Russian pilot who was killed by militants in Syria after his aircraft was shot down by a Turkish fighter jet in November 2015, RIA Novosti reported citing the Lipetsk city administration’s internet portal. “I see this as a sign of respect for a real man, a patriot who loved his Motherland and honestly fulfilled his duty as a military man and a citizen,” said Oleg Peshkov’s onetime commander Colonel Yuri Gritsaenko, who will be piloting the newly dedicated Su-34. On Thursday Oleg Peshkov’s widow was handed her late husband’s award weapon and the Order of Dedication posthumously bestowed upon him by the Syrian government. On November 24 a Su-24 bomber on an antiterrorist mission in Syria was shot down by a Turkish F-16 fighter jet.Both pilots managed to bail out but the plane’s commander, Oleg Peshkov, was killed from the ground by militants as he descended on a parachute. Navigator Konstantin Murakhtin survived the descent and was later saved by a rescue team. Oleg Peshkov was posthumously awarded the Gold Star of Hero of the Russian Federation. Russia’s latest Sukhoi Su-34 frontline bomber will soon be sporting advanced radio surveillance gear that will allow the crew to spot and destroy enemy headquarters, communications and drone control centers, the newspaper Izvestiya wrote citing a source at the Defense Ministry in Moscow. The new system, dubbed the UKR-RT, is placed inside a container attached to the underside of the Su-34 (NATO reporting name — Full Back).“Right now the UKR-RT system is undergoing field trials and will soon be supplied to the Air Force,” the an unnamed source told the newspaper. The UKR-RT is primarily designed to locate and “read” the technical signatures of communications systems, radar installations and UAV ground control stations. Independent military expert Anton Lavrov said that the new system would turn the frontline bomber into a multirole machine able to fight and reconnoiter all at the same time. During peacetime it can conduct reconnaissance without the use of dedicated spy planes, while in wartime it is less vulnerable compared to reconnaissance planes converted from transport and passenger aircraft,” Lavrov said. According to another in dependent defense expert, Dmitry Boltenkov, the UKR-RT has at its heart the M-410 radio reconnaissance system. “The M0410 is a downsized version of the more sophisticated Fraktsiya system carried by Russia’s latest Ty-214R reconnaissance plane,” Boltenkov said. Many foreign military specialists regard the Tu-2014R as a unique information gathering platform able to spot targets hundreds of kilometers away. Several such planes conducted a series of reconnaissance missions late in 2012 near Japanese airspace and are frequent guests in Syria. According to an article, titled “Russia Has Deployed its Latest Spy Plane to Syria,” which recently appeared in the authoritative Internet journal Aviationist, the Fraktsiya system allows the Tu-214R not only to intercept radar, electronic communications and even cellphone massagers, but also to use the obtained information to create an “electronic picture of the battlefield” in real time. After its successful use during Russia’s aerial campaign in Syria, the Sukhoi Su-34 fighter bomber is now set to carry even better weapons than those that made it the jihadist terrorists’ worst nightmare, Zvezda TV reported. During the Syrian campaign, the Su-34, very aptly designated by NATO as Hellduck, made effective use of its onboard arsenal of a 30 mm cannon, air-to-air and air-to-surface missiles and KAB-500S laser-guided bombs, destroying terrorist infrastructure facilities and command centers.The KAB-500S satellite-guided smart bombs are designed to engage reinforced concrete shelters, runways, railway and highway bridges, military industrial installations, warships, and transport vessels and has proved itself as a highly effective weapon against Daesh and other terrorist groups fighting in Syria. The accuracy of the KAB-500S is between 7 and 12 meters while laser-guided and TV-guided equivalents have a stated accuracy of 4 to 7 meters. The Defense Ministry now wants to add to this impressive arsenal also anti-ship missiles, such as the modified Kh-35 missile and even plans to adapt the Su-34 to launch a new generation of the so-called aeroballistic missiles. The Su-34 was designed to carry the Kh-15 hypersonic air-to-ground aeroballistic missile. Even though considered by experts as a bit outdated, modernizing this workhorse weapon will be no problem at all. The Kh-15 climbs to an altitude of about 40,000 meters and then dives in on the target, accelerating to a speed of about Mach 5, which makes it the fastest aircraft-launched missile to date. Its updated version will fly even higher and faster. Su-34 is a multipurpose fighter-bomber capable of effectively targeting surface, sea and air objects in any geographic area with the use of all aircraft munition types. The equipment installed on the Su-34 allows for the use of weapons against several targets simultaneously. Ninety-two modified Su-34s will be delivered to the Russian Air Force before 2020. Russia’s military operation against Daesh has served as a major advertising campaign for some of the best weapons in its arsenal, helping to boost arms sales and attract new buyers. As a result, a single deal with Algeria for the delivery of 12 Su-32 bombers will likely cover Moscow’s expenses in Syria. Russia’s engagement is estimated to have cost less than $500 million, according to figures circulated in the media in March. The deal with Algeria, inked in December 2015, is said to be worth up to $600 million, according to Global Security.In retrospect, Russia’s engagement was a “risky, but successful move,” Austria’s national daily broadsheet Der Standard observed. And it is what helped to push the deal forward. 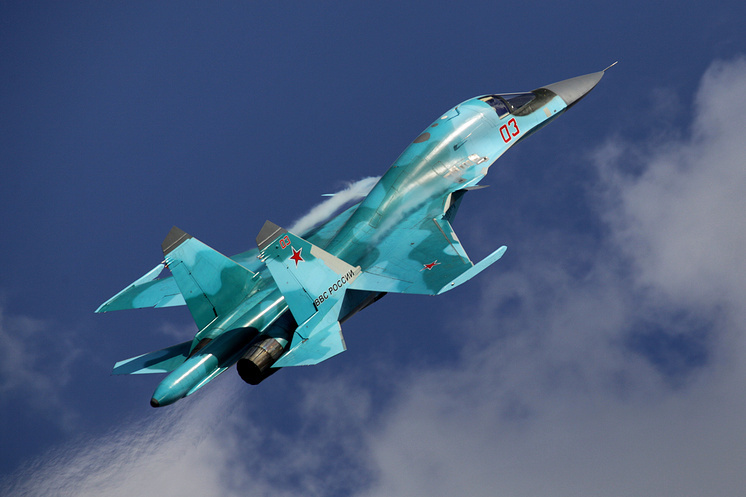 Moscow had been in talks with Algiers for the delivery of the expert version of the Sukhoi Su-34 for eight years. The negotiations appeared to be moving nowhere. In late September 2015, Russia launched its campaign; the Su-34s took part in their first battle. The aircraft’s performance was so impressive that defense experts expect it to become an export bestseller in the coming years. “Experts say that future arms deals will bring Russia’s defense industry some $6.8 billion,” Der Standard added. In this respect things are already going well for Moscow. Sergey Chemezov, CEO of Rostec Corporation, recently said that the export portfolio of Russian state arms exporter Rosoboronexport reached had $48 billion. This trend will most likely be reinforced.Russia’s arms exports amount to more than $15 billion annually, he added. Moreover, there has not been a single year when revenues dropped. Leading buyers of Russian-made weapons include China, India and Vietnam, who Der Standard described as an “old and trustworthy client in Southeast Asia.” In addition, Algeria, Egypt and Iran also purchase Russian arms. Amman is conducting consultations with Russian manufactures on acquiring a small number of fighter-bomber jets. Amman is conducting consultations with Russian manufactures on acquiring a small number of Su-32 (export version of Su-34) fighter-bomber jets, local media reported Monday, citing officials working for Russian aircraft producers. “We hope that the interest will lead to pre-contract negotiations in the near future,” the Russian official told the Kommersant newspaper. However, Jordan has not filed any official purchasing order yet, the Russian media outlet added. 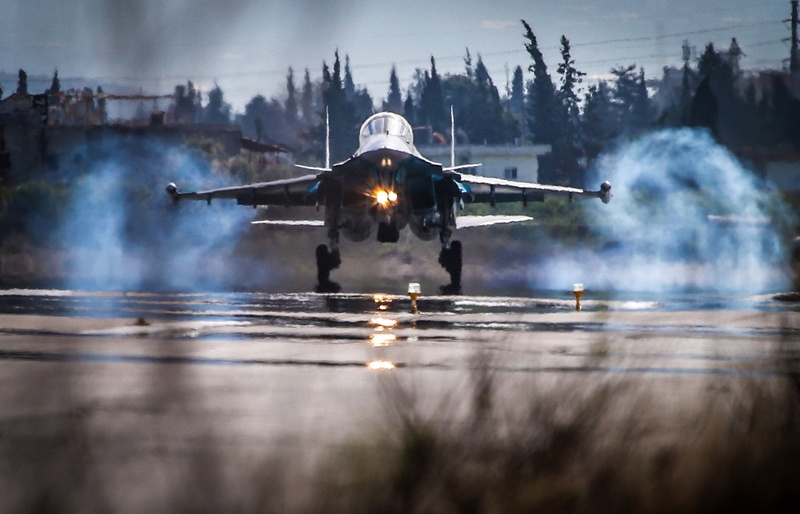 In late March, the Russian state arms exporter Rosoboronexport said Russia’s anti-terror air campaign in Syria had raised the popularity of the Su-34 fighter-bombers, which several Middle Eastern countries were interested in buying. Russia has also been carrying out negotiations with the Jordanian side for the supply of several Mi-26 helicopters used both for military and transportation purposes, according to a source in Russian Federal Service for Military-Technical Cooperation.